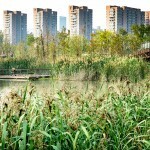 Eco-Corridor Resurrects Former Brownfield by SWA. 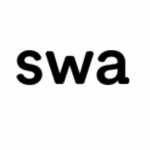 更多关于他们：SWA on gooood. 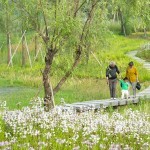 Through an innovative and carefully composed tapestry of topography, hydrology, and vegetation, the project transforms an uninhabitable brownfield into a linear “living filter.” Ningbo Eco- Corridor creates vital habitat for native flora and fauna, enhances public health, creates beautiful public spaces, and raises the bar globally for sustainable development. Just after the first phase of completion, rarely seen local wildlife has returned – A testament to the health of the restored natural systems, waterways, and habitats of the site. The successful “living filter” makes a case for similarly sized cities in the region and beyond to plan based on high-performance best practices. Ningbo Eco-Corridor is a clear example of the economic and quality of life successes that investing in green infrastructure can offer. 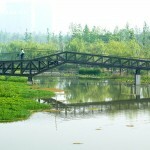 Ningbo City lies in the southern part of the Yangtze River delta eco-region. This area was historically known for its extensive riparian forests, reed swamps, rural agricultural cultivation, and a vast network of canals. 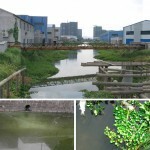 As a result of rapid urbanization, by the end of the 20th century the canals of the Eco-Corridor site were severely degraded due to a disastrous combination of industrial use and lack of effective zoning and pollution control. 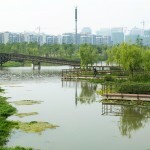 In 2002, with the dual intention of alleviating development pressure on Old Ningbo City and setting a precedent for a balanced, ecological approach to further urban expansion, the planning department called for a master plan for “Ningbo Eastern New City,” which includes six square miles of mixed-use urban development to accommodate the growing population. 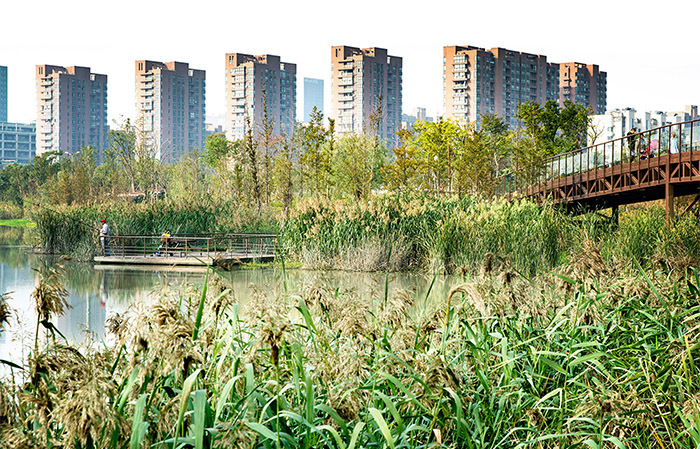 Ningbo Eco-Corridor is located at the center of this urban expansion. 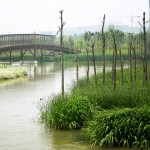 It provides a linear network of green spaces where humans, wildlife, and plants can reside, coexist, and prosper. 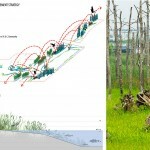 Recognizing that wetland and aquatic habitats hold the greatest conservation significance for this eco-region, the design team focused their energies on a site-specific intervention that would have historical and cultural relevance in the new era of eco-consciousness. Phase 1 (56 acres total) was recently completed, and work on Phase 2 is scheduled to begin this year. Pre-industry, the network of canals accommodated the diverse functions of transportation, irrigation, and flood control. 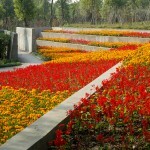 Within the Eco-Corridor Phase 1 site, water management and ecological functionality were woven into a unique park and recreation area, simulating the original canal functions. Carefully designed layers of soil, water, and vegetation offer recreational and educational opportunities, foster an increased community relationship to water, and support natural habitat in an urban context. The resulting successful “living filter” makes a case for similarly sized cities in the region and beyond to plan cities based on high-performance best practices. Ningbo Eco-Corridor is a clear example of the economic and quality of life successes that investing in green infrastructure has to offer. Topography: Incorporating excessive dirt from the surrounding development areas, the entire Eco-Corridor zone is carefully graded and crafted into contours creating a terrain of hills for recreation and valleys for storm water management. 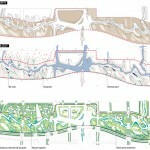 Hydrology: Replacing the existing system of dead-end and disconnected canals is a new meandering water course, with series of free-flowing rivulets, streams, ponds, and marshland that will support the re-establishment of the indigenous ecology. The newly constructed watercourse improves the quality of the canal water and makes it suitable for ecological restoration and recreational use. Vegetation: An emphasis on native vegetation supports the re-establishment of diverse plant communities along the length of the corridor and encourages colonization by indigenous wildlife. Plant selection also creates a unique sense of place: together with topographical variety, differentiation of species into groupings based on height, texture, and color creates distinct spatial patterns. Riparian Habitat improvement: Replaces existing impervious, vertical canal banks with soft, sloping vegetated banks. 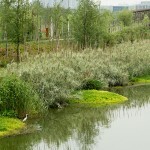 The riparian planting edge provides a green buffer and aquatic habitat, and aids the removal of contaminants from canal water and storm water runoff. Wildlife habitat structures like logs and perch trees are placed along the riparian edge to jumpstart habitat complexity and species richness functions. 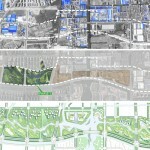 Reconnecting People and Nature: The park and trail design provides a clear example of natural processes in an urban setting. Bio-swales, rain gardens, an aquatic garden, and restored habitat were all carefully sited for maximum function, but can be easily assessed or observed by elevated boardwalks, stepping stones, bridges, and bird blinds. 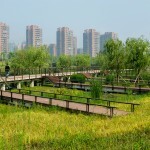 The Eco-Corridor serves as the spine of Ningbo New City’s open space system, creating and connecting a variety of land uses. Extending two miles, the corridor merges seamlessly with the adjacent urban fabric and natural systems, creating a symbiotic relationship between the greenway and surrounding city. 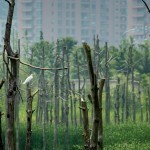 Through an innovative and carefully composed tapestry of topography, hydrology, and vegetation, the Ningbo Eco-Corridor transforms an uninhabitable brownfield into a linear “living filter.” By restoring the ecological network in this region, Phase 1 of the Ningbo Eco-Corridor creates vital habitat for native flora and fauna, enhances public health, creates beautiful and enjoyable public spaces for local and neighboring communities, and raises the bar for sustainable development in China and beyond.